Finum Large Tea Brewing Basket. Size large fits most teapots and large mugs. The cylindrical basket-shape permits effective steeping with ample room for the tea leaves to expand. Also idea for coffee brewing. Lid Included. While steeping, keep the lid on top to prevent heat loss. The lid also doubles as a handy drip-tray for the brewing basket. Cleaning: Safe for cleaning in top rack of automatic dishwashers. Manual cleaning: Rinse in hot water, or clean with soft brush. Finum best brewing advantages: Loose tea is not only much less expensive than "teabag" tea, it also offers superior flavor. Finum best brewing baskets are "flavor-neutral" and guarantee you the best possible cup of tea every time. Finum best material: Durable stainless steel mesh with heat-tolerant plastic frame and a lid/drip-tray. The stainless steel has turned permanently golden through a super-heating process. Fits most teapots and large mugs with diameter from 2.75" to 3.25". 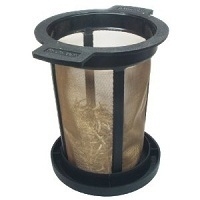 Height of tea filter is 3.75", with lid height is 4". Lana uses these filter baskets to prepare tea for all of her guests.